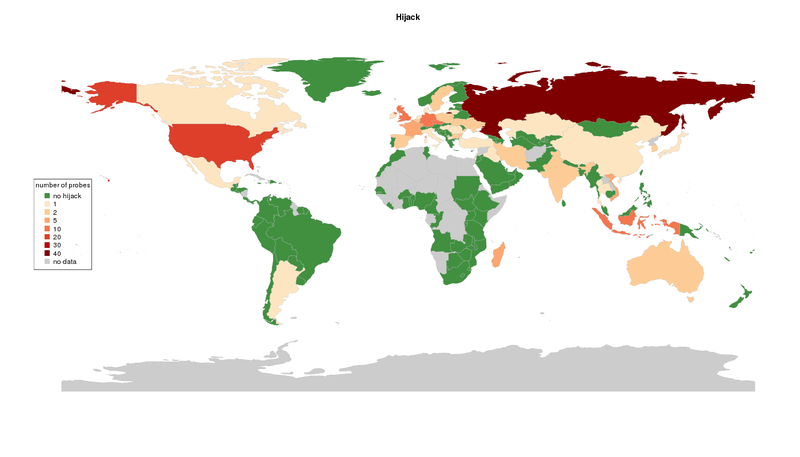 Google and a few other companies provide open dns resolvers to the people around the globe. Unfortunately it may happen that the resolver was hijacked and used for different purposes, such as redirecting to malicious pages or to block certain addresses (censorship). Our goal is to identify hijacked resolvers by analyzing their fingerprints, in order to increase safety of Internet users. To do that, we utilize data collected via RIPE Atlas (atlas.ripe.net). 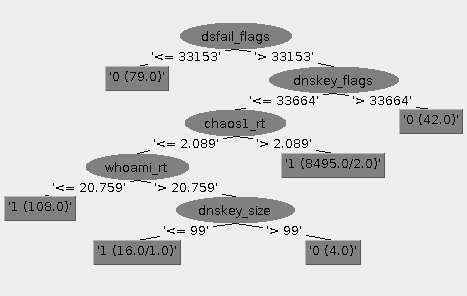 Our solution to the problem is based on observing characteristic features in replies to DNS queries. A hijacked server will likely run different software than the legitimate server, thus it should be possible to spot some small differences in server behavior. 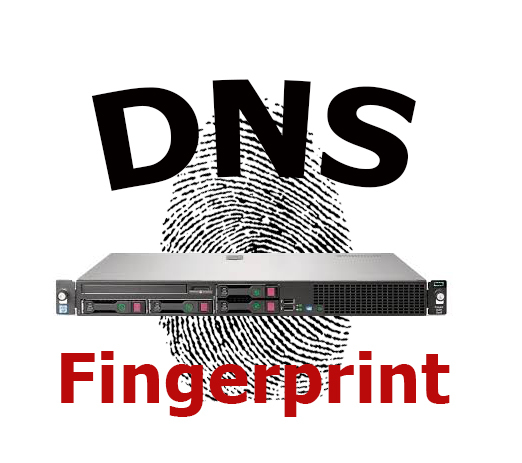 We build “fingerprints” of recursive DNS servers, or “feature vectors”. Next, we use machine learning algorithms to train computer to be able to discern between a legitimate server and a hijacked one. This domain has invalid DNSSEC records, thus a validating resolver should reply with an error. Instead, we’ve seen servers replying with NOERROR and redirects us to rogue IP addresses. We record the following features: request time (how long it took), reply size, header flags, rcode, counts of records in each section of DNS reply. The server should reply with NXDOMAIN. We record: request time, reply size, rcode. The server should set the TC (truncated) flag in the response. Google servers don’t send any replies in such a case. We record: time, size, header flags, rcode. If configured to do so, the server should give its DNS Name Server Identifier. We record: time, header flags, rcode. The server may reply with information on the software and/or host running the resolver. We record: times, sizes, rcodes, and binary flags if the query succeeded. The query should return the IP address of the resolver, as seen by the authoritative DNS servers run by Akamai. We record: request time, AS number of the resolver IP. 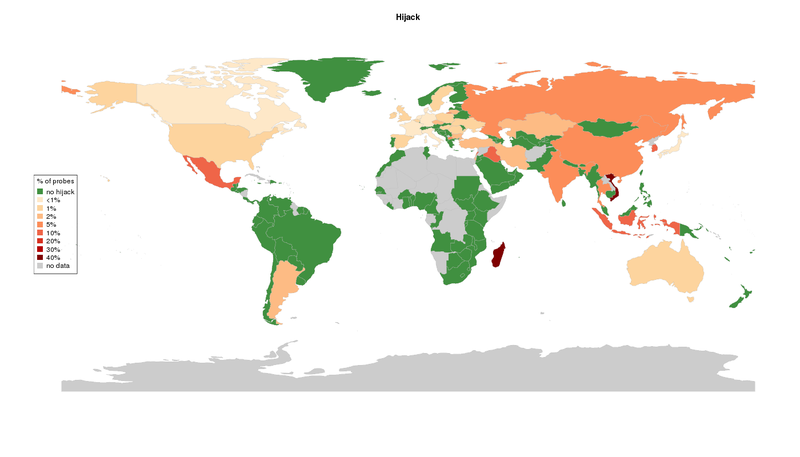 Checking if the resolver supports IPv6-only sites. It is possible to setup a domain that could be resolved only if the recursive resolver has IPv6 connectivity. An example is “ds.v6ns.test-ipv6.ams.vr.org”, used by the test-ipv6.com website. We query the resolvers for the above features, and record the results in ARFF file format, used by popular data analysis environments, as Weka and RapidMiner. Next, we train machine learning algorithms, C4.5 Decision Tree (in Weka) and Random Forests (in scikit-learn), building models for expected and not-expected server behavior. Finally, using a separate testing dataset, we classify the fingerprints into two classes: valid (ok) and hijacked (non-ok). Thus, the computer is able to assess the probability of user connecting to a valid server by issuing a few DNS queries and running a machine learning algorithm. We used all RIPE Atlas probes (~9000 probes) to send DNS queries to 8.8.8.8. Each probe issued several queries, a single query covered one of the features described above (e.g. DNSSEC validation, IPv6 only-domain reachability, NXDOMAIN redirection, …). Next, we parse the results (many JSON files) into single ARFF file using parsejson.py. Finally, we use the ml.py script to train a model, and to test the model on testing dataset. Resolvers that were classified as hijacked had significantly longer RTT for a DNS query. While PING RTT was expected to be shorter, we consider longer DNS RTT to be justified. That is because hijacked resolver was isolated and had to perform full name resolution process, while 8.8.8.8 server most likely had already a proper RR in its cache (presumably many of RIPE Atlas probes queried the same instance of Google Public DNS). This assumption seems to be confirmed by the results of a query for hostname.bind CHAOS record. DNS RTT for such queries from hijacked servers was much shorter, that it because it didn’t involve name resolution process. We did our analysis only for Google Public DNS, but we highlight that our method is not limited to Google, and can easily be applied to other operators as well. 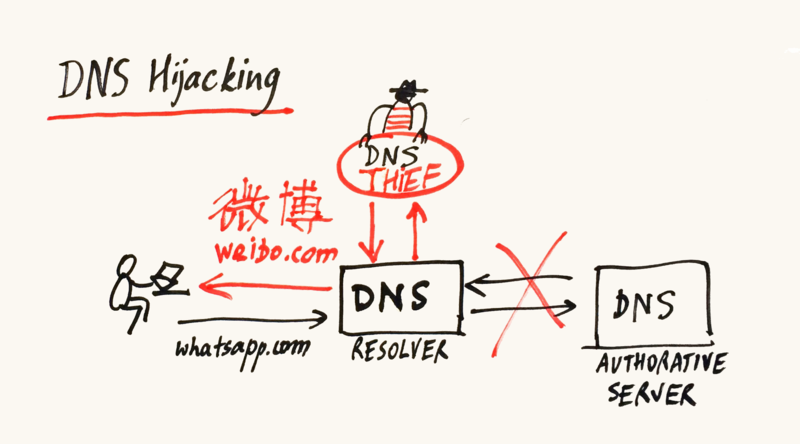 Our fingerprinting approach can also be used to detect a somehow opposite problem: an ISP pretending to be operating their own caching recursive DNS servers, but in reality redirecting their traffic to Google or OpenDNS resolvers.